Easy, Decadent Truffles…Did I mention they are EASY?? These Easy and Decadent Truffles are SOOO good! I made them last year, but don’t remember them being as good as they are this year. Maybe that’s because this year, instead of vanilla, I used maple flavouring. Wow! Delicious! These truffles are easy to make, and are melt-in-your-mouth good! Let me know what flavour combinations you come up with! Easy, Decadent Truffles...Did I mention they are EASY?? These truffles are easy to make, and are melt-in-your-mouth good! You can roll your truffles in chopped nuts, icing sugar, cocoa powder, candy sprinkles, coconut or leave them plain. I decided to try dipping mine in chocolate, and that worked great. I melted 1 cup of milk chocolate chips with 1 tsp vegetable shortening. After freezing the shaped truffles for a while, I used a fork & dipped them into the melted chocolate. After shaking off the excess chocolate, I placed them on a wax paper lined baking sheet, sprinkled with chopped pecans, and let sit until hardened. Truffles can be stored in an airtight container in the fridge. They look great and believe me, they are great. Easy and decadent … what could be better?! So many cookies/treats to add to the Christmas baking list for next year! I hope you’re all enjoying the preparations. Merry Christmas! Oh my Jeanine..yup will try these and I will choc dip mine too..decadent for sure!! A question..do you know how many truffles you get from this recipe? Thanks! I didn’t get around to making them for Christmas..maybe in the new year..I want to make these sometime for sure. 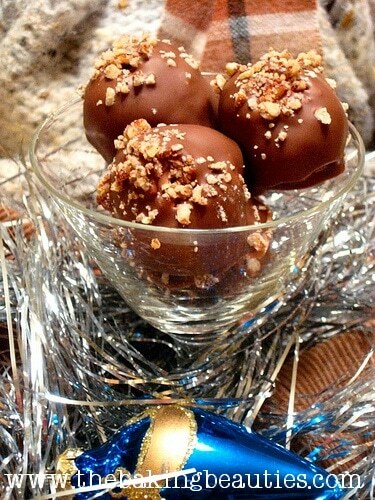 I made some truffles like these during Christmas, they were very easy and delicious. These are gluten free as well? (I know the header says gluten free recipes, but I’ve notice a lot of your recipe titles specify gluten free). I only ask cause they aren’t for me. I’ve only frozen them for short amounts of time – I think if you wanted to freeze them, I wonder if the melting wafers wouldn’t be a better option than chocolate chips? I’d just be worried that the chocolate would turn whitish, but I’m not sure. I’ve had them in the fridge for 2 weeks though (when I hid them really well) without a problem. Nothing there to go bad, really, as long as they are in the fridge. Wow, they look delicious Jeanine!! Thanks, Gwen! So easy to do too! Jeanine, where can you get maple flavouring? I presume this is different (more concentrated?) than maple syrup? Yes, it is. In with the baking extracts, like vanilla, almond, peppermint – the flavour ideas are endless! thank you! Will look for it today. I made these today. They are yummy! I dipped them in milk chocolate and dipped some in white chocolate. I sprinkled green and red sugar on them. They came out perfect! Thanks for the recipe!